Where did the mysterious culture known as the Mayas originate from and where did they go? What happened to this advanced civilization along the way? The answers are obvious and have been all around us. But we do not have the proper vision to see clearly because of our previous education (programming) that has been ignorant and does not fit the facts. For example, our general view of progressive history is wrong. It stems from 19th Century Darwinism and the erroneous view that we evolved, matured and became more and more complex. Notice the following architecture of Indians over time. A child can see that our implanted view of history is absolutely wrong. The above de-progression and progression must also include the perfect ‘steppingstone’ or intermediate societies known as the Mound-Builders. A big part of this special time period were Western Indian ages of the Hopi and Anasazi cliff-dwelling civilizations. These were later empires that retained remnants of passed high technologies/techniques, while only being shadows of what was before. Over much time, knowledge and old ways were almost completely lost to next generations. Fabulous, complex, Earthen Structures preceded simple Old West Indians and teepees. Study the post-Mayas and you will be amazed. Insert very knowledgeable ‘tribes’ of western cliff-dwellers and eastern Mound-Builders between Maya or Aztec pyramid constructors and primitive Indians of the 1800s. STONE COULD NO LONGER BE USED as the building blocks and medium for their constructions during this ‘special (intermediate) time period.’ These were modern, later ‘Indians’ and much older than what we are taught. They had advanced math, calendars, astronomy, etc. They levitated stones with methods of antigravity. They had wireless electricity. They flew…and they were also losing (Tesla-type) POWER over thousands of years. It was a matter of Energy: Now a softer material that required less energy consumption was utilized. Earthen blocks took the place of stone monoliths as empires cycled down to less complex, simpler ages. If the above theory is sound, then what vaporized the perfectly cut monoliths 8000 years ago? What evaporated the not-so-precise blocks 5000 years ago? And what wiped out the top levels of big stones that were attached imperfectly? The answer could possibly be atomics or something beyond nukes, such as Particle Beams. Each time, each cycle, humanity may have sprung back to life once more and thrived in a ‘new wave’ or Next Generation. Keep in mind that all the physical evidence from what has been left behind tells us: The Indians to come or next generation was a society (like eastern Egyptian counterparts) far less sophisticated in every way than the people that preceded them. The mystery to the strange disappearance and seeming abandonment of Mayan cities is also basic. Where did they go? They rose again out of their long cycles of destructions/creations and became the Aztec Indians (shown in round calendars). They were possibly the last Indians that worked with great weights and transported, or instantly teleported, STONE. The Children of the Maya. These were the super earth-movers in the west called Anasazi, Hopi and in the Ohio area, the Cahokians. Learn how sophisticated and widespread distant descendants of Atlantis (Incas/Egyptians) were who made marvelous architecture beyond belief out of natural materials. These ‘children’ of brilliant ages retained some old knowledge. They still had electricity, but lost the ability to FLY. These were not the pilots in disk vehicles of long ago or the more recent Mayas in airplanes. It was dark times that no longer had anti-gravity, air-vehicles and Flight. Cahokians and the Anasazi were soon to lose the electricity and fall further. [One personal note: In summer of 1982, I transplanted myself from PA. to CA. and on the journey west, saw a sign for the “Cahokia National Park” and had to stop. In front of me was a bright green hill so majestic and huge and…I had never seen a hill before with perfectly straight sides. Wow. The main mound at the Cahokia complex is much larger in volume than the Great Pyramid at Giza. Observers would normally think the Great Mound no different than any grass covered hill with a curved top, except for the very STRAIGHT EDGES on either side! The Ohio Mound was the center of an amazing, underestimated civilization that stretched over numerous states and an extremely large area in the east. Researchers know this because of similar/smaller constructions and jewelry and other artifacts found that support an advanced Mound-Builder Empire over most of the east. The Great Mound in Ohio seems to be centrally located among smaller, impressive mounds in its area (as will be explained later). Orientation of structures to the directions over a wide range of square miles was also seen in their stone-moving ancestors]. Another complete misconception (that a child could see) is the DIRECTION of Indian cultures or migration patterns in the Americas over time. In what direction did civilizations move over thousands of years? The answer is northward. The first Indian Societies were the (super) Pre-Incas who seem to have landed on the Altiplano of Bolivia and Peru and colonized barren, inhospitable mountaintops. 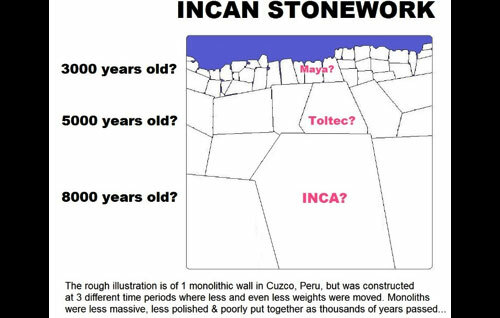 They built inconceivable strongholds with individual monoliths (transported from lowlands long distances) that weighed hundreds of thousands of tons! South America was the start with virtually ‘impossible’ stone constructions in a place where no one should have ever been able to live. They even farmed on terraces on top of the Andes Mountains. INCAS HAD NO HIEROGLYPHS: a major mystery that is resolved when you consider a Psychic Society that used more of the brain’s potential does not need a written/spoken language! The Mayas, along with Egyptians, began IDEOGRAMS or hieroglyphs carved deep into stone. Lasers cut the first complex language, etched into stone, carvings that cannot be duplicated today. We (humanity) were also losing our spirituality, mentality, psychic powers as well as our technology. The Indians’ creation of an array of Mind-Expanding stimulants was to get ‘us’ back up to long-lost, higher mental states that we had used, naturally, in prehistoric times. Much later, thousands of years later, apparently it was ‘safe’ for the Indians to come down from the Andes Mountains and they built in lowlands and dense jungles of Central America. Teotihuacans and the Toltecs were pre-Maya ages that constructed more impressive pyramids with larger monoliths than what was achieved much later in (relatively primitive) Aztec tribes. Central America became the homeland of Incan descendants. Examine Mayan hieroglyphs, deeply carved everywhere on stele (not monuments), totems, standing stones or their charged rock ‘utility poles.’ Indians went from Incan no-hieroglyphs, no-spoken language to the most incredible culture of profound etched symbols and representations. Later still, devolved the Mound-Builders and the migration pattern over time was a movement northward into the area of the United States. Next generations of tribes in the last few hundred years spanned the U.S. and Canada. Indians went north. North! Then why do they still talk and teach of Indians originating from Asia that WALKED to the Americas on a ‘land-bridge’ long ago? Thor Heyerdahl’s ships SANK. If Indians migrated south over time, then Canadian (Incan) fortresses would be snow-covered. There are no examples of early Indian, massive, monolithic architecture in Canada or the U.S. Are we to believe Asian Indians, primitive peoples, walked from the tip of North America all the way down to South America, then mountain climbed straight up sheer cliffs and started their civilization there on the High Plateau, where nothing could grow? Really? What’s wrong with this picture? As thousands of years passed, empires of the next and lesser Indian ages lost knowledge and techniques. Incas transported themselves in saucers: flying disks (‘carpets’) like East Indian air-ships or ‘vimanas’ reported in very old books of India. Mayas devolved down to an age of airplanes, then later still…the age of flight was no more, lost in time along with everything else. There was once Weather-Control, world weather-control, a programmed planet…until utopia ended and (destructions/creations) once more cycled a civilization. How else could Incas FARM and live on top of the Andes? But the much later Mayas of Machu Picchu also farmed in a neat system of terraces in a very harsh land. This might not be due to World Weather Control, but simply farming inside a controlled environment or within a force-field, protective bubble? What kind of society preceded them and the state of humanity that came after? Don’t call them ‘Indians’ unless you understand the scientific and technical greatness of what an Indian was. (Of what we were). Hollywood, documentaries and TV have not implanted our psyche with favorable impressions. [Ask the late Marlon Brando on that point]. Indians are portrayed as simple SAVAGES. It was not Indians that invaded; stole land; broke treaties; raped, killed and brought diseases…it was us. Teepees are forgotten ‘antennae’ and still receive a trace of energy. Teachers and their narrow textbooks inform us ALWAYS of primitive Indians from the past. Early Indians are shown as closely connected to the Earth, but at a crude level of development. The enigma of fantastic PYRAMIDS in the background vegetation, jungles, undergrowth or sands only heightens the mystery when in the foreground stand fallen, native ‘children’ who have totally forgotten what came before. How odd that the first white men thought the ‘gods’ had to have built what stood amid these ‘stupid savages.’ While the Indians who first encountered Europeans believed here was the ‘return of their gods’ and pyramid-builders. They did not know who built the astonishing ruins of fantastic stonework either. Schools and universities completely misunderstand the early human again and again. Indians such as the magnificent Mayas and amazing Aztecs are depicted as pagans who performed bloody rituals and sacrifices. They’ll show us stone troughs where (supposedly) blood poured, yet they’ll not understand the PHYSICS required in the architecture: Stonework was not done by primitives, therefore…no blood-sacrifices by ritual pagans. The old view is only our ignorance. Darwin was 100% wrong. They’ll show us not only their misinterpretations of Indian hieroglyphs, but also their misinterpretations of Indian art. Bloody illustrations painted on stone walls were not sacrifices to pagan gods, they were INSTRUCTIONS. They are wisdom. The pictures were sophisticated, medical operations which ‘educators’ have misinterpreted. Prehistoric ancients were scientists. Are blind researchers not seeing the pictures of electric lights, modern clothes, equipment, techniques, vehicles and ‘futurism’ in the Indian portrayals? Indian and Egyptian art clearly demonstrates FLIGHT. Maybe we have to adjust our view and accept new, controversial, unconventional, alternative perspectives? Remember, we did not discover the stone wonders, colossal, Incan fortresses atop the Andes until our first airplanes flew over the Altiplano of Bolivia and Peru. People cannot simply walk up to the Andes Mountains. Have you examined Puma Punku and Tiahuanaco, closely? The first Incas and much later Mayas [Machu Picchu above] who possessed anti-gravity and saucer travel, went in-and-out of these extraordinary dwellings some way other than walking. Possible answers are jet-packs, mini-crafts (like the ‘Jetsons’) or some means to electrically, magnetically go up-and-down. When we apply high-tech answers, questions tend to go away. Consider the Indian Flyers (‘gods with tech’) crossed the ‘pond,’ warred or pirated during biblical times along with Egyptian air forces and those from India. Such concepts explain the Old Testament miracles and a myriad of mysteries. [Read Yurchey’s High Technology in the Bible]. A lot of sci-fi is actually ancient History, such as cloning! This can be implied or physically demonstrated when we measure the size of brain cavities, which determine INTELLIGENCE. Are you aware Cro-Magnon brain size is larger than the modern, human brain size? Cro-Mags were the CLONERS or the ‘gods’ and flyers of the ancient world, the high-tech scientists (angels?) or Super Indians. Other so-called ‘primates’ were the clones with smaller brains for lesser functions (servants, soldiers). None of these life forms were ape-like in any way; it is a continued, reinforced misconception. “Primates” were all discovered at the same level; they each existed at the same time. This proves Darwin wrong. Anthropologists ‘sweep under the rug’ the little fact that Cro-Magnons indicate WE HAVE DEVOLVED over thousands of years, the exact opposite of obsolete Darwinism and progressivism. Not surprisingly, investigators have unearthed large numbers of “bulbous” Cro-Magnon skulls always in the vicinity of phenomenal ruins of the Pre-Egyptians and the Pre-Incas. There’s a connection. 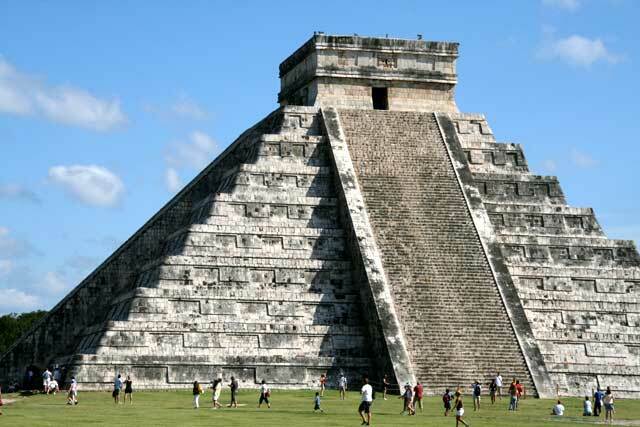 Extraordinary, Mayan, stone cities with alignments and grids-in-grids and aligned pyramids adorn the dense jungles. We do not know the exact age of the rock architecture. No one knows the age of stone cities since the question is: When was the rock cleaved? That is an unknown. But the Mystery with the Maya and their (not random) pattern of splendid sites lie in the ISOLATION. These are Island-Cities, for the most part. Pyramids and stone centers, plazas, courtyards, quarters, pools, bridges that concentrated into a stone ‘city’ were not dependent on ROADS. Mayas built ‘island-cities’ between thick vegetation, not dependent on wheeled vehicles like stupid Europeans and most of the planet. In fact, there’s no sign of The Wheel ever being used among the prehistoric Indians (or written languages). They (we) had something better. ‘Island colonies’ would be precisely what we would construct if we mastered FLIGHT. NASCA (famous lines that are not ‘runways’ for aircraft) is another example of flight among Indians. The laser-straight lines go on for miles. Notice that the furrows are only 4 inches wide; everywhere, the lines are a consistent four inches in width. The straight marks were made in such a dry land with very little erosion, like the Moon, they have remained for a long time. Here’s what no one talks about: In every giant drawing, only discernable from the air, “the pen does not leave the paper,” in essence. There are no cross-hatched lines or ones that suddenly stop. Nazca images seem like they were ‘Etch-A-Sketched,’ but really they were sprayed from the air, done with continuous lasers. Why? Probably for the same reason as much of Indian art: Records, Instructions or in the case of the flat Plain of Nazca with no high vantage point: SIGNPOSTS. The Spider, the Monkey, the Bird and others meant something long ago like road signs, only for air-ships. Also, where is the top of a mountain that was sheared off at Nazca? Uxmal, Tikal, Tulum, Chechen Itza and other marvelous settlements were connected; they were connected by what some have referred to as ‘ancient astronauts’ or the ‘gods’ or simply the survivors of great wars in the past. They flew. They had spacecraft. Maybe they could beam? Where are the crafts? Outside of Indian art, painted or etched representations, where are the remnants of physical vehicles themselves? The question can be answered: HEMP. Indians did not use METAL. They were smart (as in how they acquired and distributed Electricity). Their Power Stations were stone. But for every vehicle, ship, transport, device or heavy machinery, why in the Great Spirit’s name would you use metal when you fabricated endless masses of a natural substance stronger than steel?? Yes, in 100 years, the disk vehicles or saucer Vimanas and mechanisms and everything else made of Hemp decayed into mulch. [No landfills] You simply spat out more in a utopia that does not depend on money and a capitalistic system. There actually are Mayan Roads; this is a late invention. It is one more example of the collapse of human society: from sophisticated, electrical aircraft and then a great plunge down to the lowly airplane. Oddly, representations or models of stylized delta-wing fighter planes don’t really indicate advancement in Mayan society…but show its decline. Roads do appear or have been unearthed among the Maya in certain areas. And they were maybe the “most incredible roads ever built!” Were there unbelievable terrain-vehicles that went with the super roads, now lost in time? Again, with an understanding of far greater technology that came before, super roads is not a sign of advancement, but an example of a retro backslide or a decline. Another, important, essential way that connected Island Cities of Maya and Aztec (also used by Mound-Builders at a future time) has to do with the Electro-Magnetic Power through the ground and the extraordinary, wireless work of Nikola Tesla. [Please see previous work on Atlantis and the World Grid]. Keep in mind that Mayas knew of radio and television because they had methods and knowledge far in advance. Something that can only be ‘television’ was described among old Mayas and possibly represented in art: a TV apparatus. Legends told of a ‘ladder in the sky’ that truly connected Mayan colonies or settlements, that might be better understood as radio ‘sub-stations.’ The mythical ‘Ladder’ could be a NETWORK of broadcasted EM energy or grid system along the wireless lines of what Tesla tested and wanted for us. 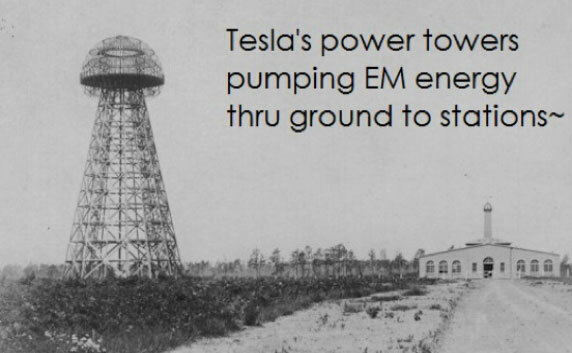 The illustration is taken from a Tesla diagram of, basically, how his Wireless Power System worked. Imagine the ground as a fluid. 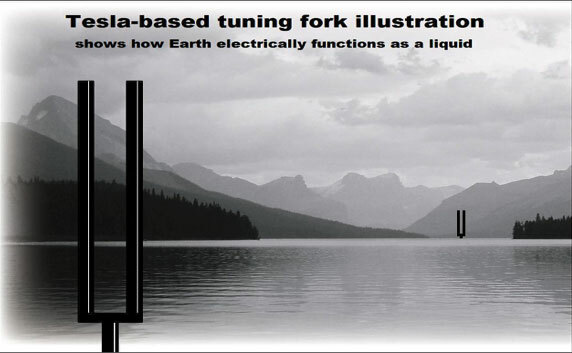 At vast distances are Tesla towers in a GRID network that functioned as giant Tuning-Forks. Any transmissions: TV signals, radio, pictures or electrical POWER created by the one prime Tower are automatically recreated at other smaller towers in the grid-system, harmonically…like ripples in a stream. All sub-station towers BEAT in perfect sync with the main one, what Tesla called a ‘Magnifying Transmitter’ (Wardenclyffe). Everything oscillates, charged and AMPLIFIED by the turning Earth. Consider the layout of isolated, Indian cities in (charged) stone. They form patterns if you step back. Look how a prime Station, with nearly perfect alignments, was always centered among smaller structures over distance and in a pattern (or grid). It happened at Prime Stonehenge and smaller Druid circles that surround Stonehenge and even reach Northern France. In Africa, prehistoric Bantus built the curved, stone walls of the Prime Zimbabwe Complex, while smaller structures also surround the main Station. A Prime Pyramid generated the wireless power and broadcasted the energy to smaller sub-pyramids or receiver-stations. Obelisks, totems, standing stones, stele, great spheres and great Statues ‘from the gods’ were Utility Poles and functioned as receiving dishes for the Electro-Magnetic, resonant energy. The next time you view Mayan stele, such as at Copan, notice how perfectly the ‘poles’ were positioned in the stone plazas. They were placed where modern society would place utility poles. Above is a gargantuan ‘center’ of the Toltec, a flattened pyramid with massive statues that are not statues; they functioned as ancient Power Poles. Examine how laser-straight the rows of standing monoliths are, a trait the later Mayas incorporated only on a bit smaller scale. Was this a huge Power Outlet or generator-station for saucers and flying crafts to recharge? See how enormous Toltec sub-station Poles (totems) are compared to the size of people. Investigate the ‘City of the Gods’ or Teotihuacan with the Pyramid of the Sun and Moon. Did Easter Island statues also generate high energies? Or the metal Pillar in New Delhi? What super achievements can be done when we master ‘Tesla Technologies’ or resonant frequencies amped by the EM power of the Earth?…unless you go to war and destroy the all-important Prime Pyramid or Transceiver! Then, the power grid collapses as has happened often in human history. Next civilization and power grid was always not as great as the one before it. Tesla had the right idea at the wrong time. We won’t have Tesla Tech again until WAR is not the prime directive and peace is inside our hearts, as it was in the beginning. Atlantis was Eden and we have fallen a very long way. Your the celestial counterparts of the mysterious sensations crafted perfectly on the planet world’s. Still sure about doing research for the world, and forward time goes the quest never ends.as well as our articles on the universal page knowledge/Truth & reason? Thanxs your awesome article subjects ruled. Your mystery assistance provided free of charge,now let’s find the way and let none other tell yah’s any different advertised chaos can’t stop our say in the matters. Cheers for that I’ll do some research then and get back to you guys here about my discoveries,maybe the future ain’t so bleak if we could gets some practical applications into place we just have extremely challenging tasks of convincing our selves and humanity that we are for the best interest for society and the world for that matter,take care and let’s the force be with us,sort of anyway. Is it bleek or bleak not quite sure? of all the way-full truth we rule the lores on earth.